Is dressing up a family affair at your household? 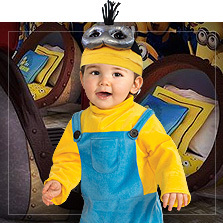 Then you’ll want to have a look at these adorable baby costumes so your little ones join in the fun! 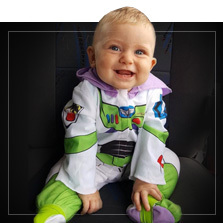 Most of our baby costumes feature a onesie or jumpsuit and a hood for easy dress up. 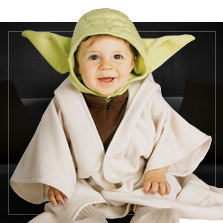 Your baby should always feel comfortable dressed up as his favorite animal, cartoon or storybook character. And our super cute sack costumes are perfect for keeping newborns warm and cozy. 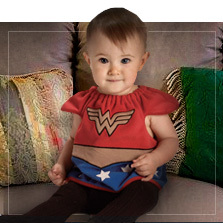 You’ll also find baby costumes that include skirts or trousers, all of them are made with soft, pleasant materials. 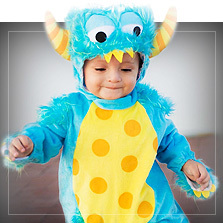 Look for your baby’s size, from size zero up to two years old, and if you need a larger size you’ll surely find what you need in our children's costume section. 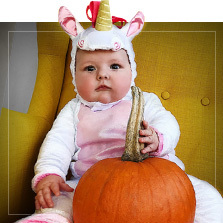 Our collection of unique baby costumes also includes funny themes for Carnival and scary ones for Halloween. 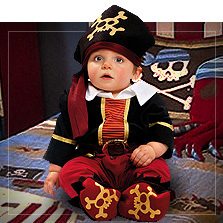 Explore our huge range of animal, princess, pirate, scarecrow, superhero, cartoon and professions costumes for babies. 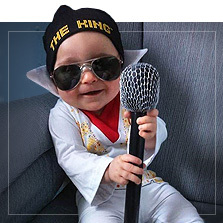 Coordinate your costume and your baby’s costume and you’ll be the best-dressed family at the party. Let the fun start!